Pound cake is a dense and rich cake, traditionally baked in a loaf pan. The cake takes its name from the original recipe, which called for a pound each of butter, eggs, sugar and flour. Today, most pound cakes include chemical leavening like baking powder to help them rise. A skilled baker can opt to bake a pound cake without baking powder, but getting it to rise will require some elbow grease. You can make an excellent traditional pound cake by combining 2 sticks of butter, 4 large eggs, 1 cup of granulated sugar and 1 tsp. of vanilla. The dry ingredients include 2 1/4 cups of cake flour, 1/4 tsp. salt and 1 tsp. baking powder. Unlike most cakes, the baking powder plays a relatively small role in leavening pound cakes. If you prefer a moister and slightly less dense pound cake, choose a recipe that includes milk and a higher ratio of fat, like butter or shortening, to the other ingredients. A high, finely textured pound cake requires special care as you combine the ingredients. Combine the butter and sugar and beat until light and fluffy with a hand or stand mixer. Add the eggs one at a time, beating for at least 1 minute after each addition. Quickly mix in the vanilla. Lower the mixer speed and blend the flour just until a stiff batter forms. While modern pound cake recipes do include baking powder, if you mix the basic ingredients in a pound cake correctly you can bake a delicious cake without any chemical leavening at all. 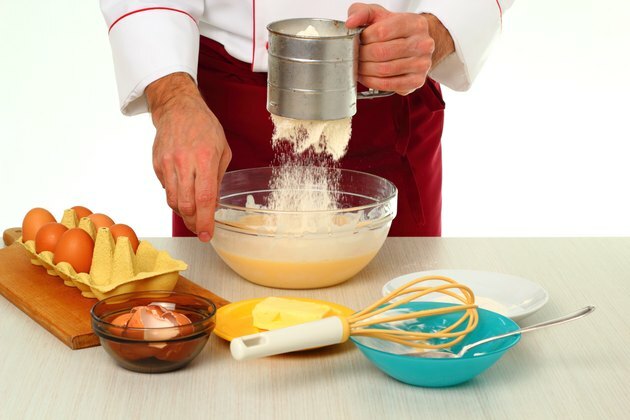 Mixing the cake correctly is essential, since the eggs are the sole leavening agent. Start with all ingredients at room temperature, particularly the butter and eggs. Beat the butter and sugar for a full five minutes and allow at least two minutes of mixing after you add each egg if you'd like to bake a pound cake without baking powder. Fold in the dry ingredients by hand as gently as possible for the best height, rather than relying on your mixer. Baking a pound cake without baking powder can result in a heavy, grainy cake with an unappealing texture. The flavor will not change, but you'll lose the traditional high, cracked top. Very careful mixing can prevent this, but the baking powder acts as an insurance policy for your pound cake. What Can I Use to Replace Eggs in Sugar Cookies?